When Ford took over the reins at Jaguar in 1990, the company had just two cars. The XJ6 (XJ40) saloon, which was relatively modern but flakily put together, and the XJ-S, which was beautiful but ancient. It was clear from the outset that if Jaguar was to succeed in the future, then it would need to expand and diversify. Two immediate plans were hatched – to create a new XJ saloon, which became the 1995 X300 (and, two years later, evolved into the V8-engined X308), and to launch an entirely new sports car as a replacement for the stately dinosaur that was the XJ-S.
Development for the XJ-S replacement commenced pretty much as soon as Ford’s ownership of Jaguar began, based on plans originally hatched in the mid-Eighties to develop a sports car known as the F-type – a spiritual successor to the legendary E-Type. That project, codenamed XJ41, was shelved due to a lack of budget, but was revived under the codename X100 in 1991, with chief designer Geoff Lawson’s team creating a series of design studies that modernised the original idea. By 1992, it had already moved forwards into the advanced engineering stages – a work pattern previously unheard of within Jaguar, but common to a global behemoth such as Ford. It would be the 1996 Geneva Motor Show before the finished car was put before the public, however, with sales due to begin that summer. The new model, which was given the name XK8, was instantly popular – its proportions were butch and beefy but retained the grace and elegance for which Jaguars were traditionally well regarded. The curvaceous rear arches and wide haunches were rumoured to be a nod to Geoff Lawson’s love of the Chevrolet Corvette C3 (if you park the two side-by-side you can see the similarities), while inside, the cabin pointed towards a brave new dawn, with curvy plastic mouldings, a digital trip computer and column stalks and switchgear lifted straight from the Ford parts bin. Under the bonnet, the newcomer came with a new 4.0-litre V8 engine, which would later also appear in the XJ saloon. Developing 290bhp, the XK was quick but not brutally so, while the compact V8 was also fairly economical, capable of low-20s MPG if driven tamely. Coupe and convertible models were offered from the outset, while in 1998 the supercharged XKR arrived, turning the XK into a genuine bruiser, with 370bhp and the capability to accelerate from 0-60mph in 5.2 seconds. 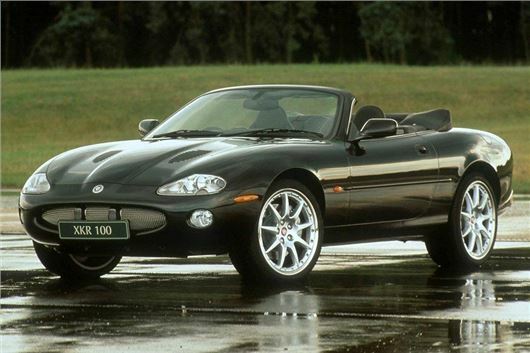 The big differentiator between the XK8 and XKR, though, was the chassis. While both models were fine to drive, the ‘R’ was much more of a sports car and the XK8 a grand tourer. The more powerful car was sharper, more agile and altogether firmer, giving it a distinctly different character despite its discrete outward appearance. Several special editions followed, with the Silverstone, XKR 100 Centenary and run-out XKR-S models being the most notable, while in 2002 the engine was increased to 4.2-litres, in line with the new flagship engine from the new alloy-bodied XJ saloon. After a nine-year production run, the X100 was put out to pasture in late 2005, making way for the all-new lighter and leaner XK, which also pointed towards Jaguar’s new styling direction – hints of the XK’s replacement are visible in today’s F-Type, for example. In it’s time, though, the XK was both desirable and a huge success, outselling Jaguar’s sales expectations in the UK, USA and Europe throughout its life, despite criticism from some parts of the media that it wasn’t enough of a sports car, or that the Ford-derived switchgear cheapened its image. As a future classic, the XK8 is already on the up. A couple of years ago, you could pick up a scruffy one for a couple of grand. Today, those cars don’t exist – most have thrown up one expensive bill too many and have been broken apart to keep others on the road. You can still get a half-decent one for about £4000, though, and that’s not a lot for a car that cost 15 times that when new, while £7000 should get you behind the wheel of something nice. They do like to rot, though, especially around the rear quarters, so check any potential buy carefully, and also be wary of early cars if there’s no evidence of the Nikasil bore liners or timing chain tensioners being replaced, as these were a real issue in the early days… other than that, they’re quite reliable, and a good one is guaranteed to hold its value. Great motor the XK8. I never worried my pretty little head about the Ford switchgear or lack of sportiness. It was a proper grand tourer and damn good at it. It looked lovely, beautiful lines and turned heads. The V8 was smooth but had a kick when needed. And the dashboard burr walnut was a joy to behold. Any less than perfect XK8's out there need to be saved/restored because I have no doubt in coming years they will become even more desirable and prices will soar. These cars make you feel like a million dollars. Give me a smart convertible, a sunny mountainside road to drive on, and Matt Monroe on the CD singing 'On days like these' and I'll be a happy man. Lovely jubbly! I'm in Queensland and bought a BRG Classic Coupe 20 yrs ago. I could pretty well afford to buy anything I like but am yet to see anything as all round lovely as the XK8. Garaged when not in use my car has only just done 40,000 kms (that's about 25K miles) and I intend to keep it till I'm a little old man. The 4 litre V8 sounds like a ball-tearer when pressed. Radars and officialdom have closed off that avenue of pleasure for us Aussies since but I still love that car and just enjoy seeing it sitting there begging for day out. Great car, if just left on the drive to admire its lines. I've had two XK8s - four engines, three gearboxes, lots of rust, eventually too much, even for this die hard Jag enthusiast. My X358 is ten years old now, never had a problem with that. Had XK8 for 5 years, toured to The Algarve from Uk over two week period, and never missed a beat. Drew lots of admiring looks, and will always remember cruising through Vilamoura with the top down. The car could pick it’s feet up and with a specialist exhaust made by Swallow garages, most heard the V8 rumble before seeing the car. Sadly missed, but Jaguars still in the family, can’t leave them alone.